1. Small inversions and deficiencies are more difficult; they rarely lie flat, they often do not synapse completely, and when they do synapse completely they do not lie flat at all. Here you have to work from partly synapsed chromosomes, and, moreover you really do need to have at least one nucleus with the aberration completely asynapsed—because a small deficiency can look like a small inversion and vice versa, when synapsed, but when asynapsed, the difference is obvious. If you find a particularly pesky one that synapses too well, try doing your squashes over a balancer (after having satisfied yourself that you know where the aberration is over wild type! ); pick a balancer that has a breakpoint within a couple of number divisions but not much closer, because you are going to need to be able to compare the banding patterns of the asynapsed normal (balancer) chromosome with your aberration, so you need to be able to find that region in the absence of being able to work down from the tips and so forth very easily. To prepare yourself for this, when you get a good balancer preparation from your outcrosses, amuse yourself by trying to find that chromosome's landmarks in it. It is very important to be comparing normal and aberration chromosomes in the very same nucleus here; although the variation in fine-scale banding patterns (i.e., which faint bands are visible, whether a grainy band looks grainy) differs less within one larva than between them, there still does exist within-larva variation (see Note 34). For these you have to get asynapsed, well-stretched chromosomes to ask whether all of the faint bands are still there, but really small deficiencies/inversions are just plain invisible by this technique. 2. As you will very quickly notice, bunched-up, unstretched chromosomes only show the darkest bands, whereas stretched ones show the fainter ones; overstretched ones show them all. Once you know your region very well—so that you can find it in overstretched chromosomes—even these become of use if you really, really have to get a breakpoint down to the band (see Note 35). 1. Euchromatic-heterochromatic breakpoints have the additional problems that the euchromatic bands on both sides of the breakpoint are underreplicated and that heterochromatin itself makes bands; never, never, never assign a band identity in a euchromatic-heterochromatic aberration without seeing it synapsed with the homolog, and always, always, always work in to that breakpoint from both sides. You will always have larger uncertainty ranges when the "other" breakpoint is in heterochromatin. 2. Sometimes you will be able to tell which arm the heterochromatic break is in and sometimes you will not. Heterochromatin synapses with other heterochromatin freely and also frequently stretches and breaks during the squashing procedure. If you see some nuclei with your arm stretched out but with a fuzzy patch and others with that region of the arm pulled back to the chromocenter, you very likely have a heterochromatic break! If you often see that region of euchromatin associated with the heterochromatin of, for example, 2R, then it is likely that the heterochromatic break is in 2R heterochromatin. However, this is something you cannot be really sure of unless you find a cell where that heterochromatin is being banded and also gives you a synapsed-up "cross" configuration; this is much more likely to occur if the heterochromatic break is just barely into the hetero-chromatin in the first place. Many people seem to take the "association = iden tity" route because there are relatively few aberrations in FlyBase where arm of heterochromatic break has not been at least guessed at, but for at least many heterochromatic aberrations you will find that any arm may be associated with the euchromatic break if you look at enough nuclei. I myself use the new terminology "Ab(euchromatic arm;h), euchromatic breakpoint" unless I'm reasonably certain I have seen convincing cells. Of course, if you have information from the aberration's genetic behavior you should say so [e.g., "T(2;3) inferred from genetics"]. 3. The Su(UR)ES system (12) can be very helpful if you really have to know more about an heterochromatic breakpoint. 4. A few other descriptions of how to do salivary cytology can be found in refs. 1,13 and Chapter 11. 1. Atmospheric CO2 provides enough buffering as long as the solution is made up at least the day before. The quality of water seems to be irrelevant; even hard tap water is satisfactory in my hands. This can be kept for months or years but discard when something is visibly growing in it. 2. Take an Eppendorf tube, pipet in 1.00 mL "rough" stain, add 30 |L of concentrated lactic acid, 90 |L of glacial acetic acid, and 90 |L of water; this gives the "final" stain. Shake well, spin down for 10 min in a microfuge, and try it. 3. This must be made up fresh for each session, but the ratio does not need great accuracy; eyeballing "3 vs 1" with Pasteur pipets is good enough. Mix the components thoroughly. 4. You want the fattest, happiest larvae possible; in my experience, good food is more important than temperature, but high temperature gives poorer larvae than lower—if you can, rear these cultures at 20-22°C (room temperature). 5. Unless you are really confident in your virgining ability, take the females from the balanced aberration stock. 6. However, do check to be sure that the preparations you think are balancer really are (look up that balancer's breakpoints and find some distinctive feature); your aberration chromosome may be more complicated than you expect it to be—if so, it too may exhibit asynapsed regions. 7. If your institution does not stock these, make your own. Start with a piece of absorbent toweling about 300 x 200 mm, fold it in half across the longer dimension, then fold each long side in approx 30 mm. 8. I cannot get proper tapping with, for example, the eraser end of a pencil, although some people swear by this tool. 9. Many of the errors I have encountered in checking the cytology of others can be traced to their having used the wrong map. 10. The fixative solution tends to creep up and over the sides of its well; having it separate from the wells of saline keeps it from getting into the saline. If the fixative ever does get into either of the saline wells, STOP, discard all saline and larvae, wash the wells, and start over; preparations made from such contaminated saline will be too poor to use. 11. If the central part of each gland is a much denser white than the rest, this indicates that the gland has started producing glue already; old ones will seep this material out into the fixative. Both such glands are too old to give good preparations; toss them at this point. Old glands can also be detected at the time of dissection by their slightly knobby surface texture. 12. A trick that gets those foody larvae up onto the walls which you may not be able to apply for political-correctness reasons is to blow (or have a friend blow) a puff of cigarette smoke into the vial, replace the plug, and wait 3-5 min. 13. Yes, yes the larva will be thrashing around after the first grab; the trick here is to do the transfer to the dissecting well, turn the larva loose, then do the two grabs in very quick succession. If you miss the "nose" grab, release the body grab too and start from the beginning. 14. If the larva ruptures anywhere else, so that the salivary glands do not float free, do not waste time trying to dig them out; toss the whole larva and start fresh with a new one. 15. My only use for a Pipetman! 16. Usually the gland(s) just float off the forceps into the stain, but if you need to use the other pair of forceps to encourage them off, do so. 17. Do not prick yourself! But do rub all contaminated surfaces well. 18. This does not always work as well and can bend the tips. 19. Simple care is sufficient; I do my own salivary preparations at my fly-pushing microscope, in a room full of stocks plugged with cotton. However, I leave some time for the dust to settle before starting cytology if I have just been handling cultures and their cotton plugs. Do not, however, try to make these or any other cytological preparations while wearing a fluffy sweater! 20. Alternately, or if your skin is particularly sensitive, wear a glove on this hand. 21. If the cover slip breaks, you have tapped too hard. 22. This technique of tapping and looking works quite well for preparations for in situs too; however, do it on the black plate and move the forceps' end to block the direct light for looking—so that the cells show as white fuzz before the first tapping. This white fuzz will disappear if the first tapping has successfully broken the cell membranes. 23. This guards against the cover slip slipping during squashing. 24. This guards against having the slide break from slight irregularities in the bench surface. 25. At this point, you can actually see the spread chromosomes with dissecting-microscope magnifications (highest magnification against a white background). 26. You must not go back to a high-dry 40x lens now—you will get oil on it! 27. Or at least be able to say that there is something wrong there but cannot say what because another arm is lying over it, and so forth. 28. Do not panic if you see some regions perpetually in knots; some regions synapse ectopically with great regularity. The proximal half of 2L is particularly prone to this, but other regions do too. If in doubt, look at a preparation from a different aberration or from wild type. 29. However, first take a break; rest your eyes—it is very important to force yourself to take eye-rest breaks very often, especially when first sitting down to compound microscope work. No lens is completely flat, and 100x lenses induce motion sickness quite quickly. If you ever start to feel even slightly nauseous, stop working immediately and do not come back to the microscope until the next day at the earliest. Your effective working time will increase quickly, but only if you do not push it! 30. If you are having trouble seeing any of the fainter bands, you are probably overstaining your preparations. 31. If there seems to be about the same distance between C1,2 and the breakpoint as between the breakpoint and D1-3 you may guess that the breakpoint is rather near the middle of C, but you do not know that so the formal description remains 69C3-11—unless you have seen some of the lighter bands and are as sure as you can be that you have identified them correctly. 32. You do not want to be trying to find your breakpoint from those maps very often; they are too detailed for by-the-microscope use. 34. You also need to be sure that you are looking at the aberration chromosome and not the balancer!—particularly if you are having trouble convincing yourself that there is no aberration there after all. 35. To produce overstretched preparations deliberately, do the tapping as normal but just before you squash use the back end of your forceps to move the cover slip laterally about 1 mm. 1. Lefevre, Jr, G. (1976) A photographic representation and interpretation of the polytene chromosomes of Drosophila melanogaster salivary glands, in The genetics and biology of Drosophila, vol. 12 (Ashburner, M. and Novitski, E., eds. ), Academic, New York, pp. 31-66. 2. Bridges, C. B. (1938) A revised map of the salivary gland X-chromosome of Drosophila melanogaster. J. Heredity 29, 11-13. 3. Bridges, C. B. and Bridges, P. N. (1939) Reference map of the salivary gland 2R-chromosome of Drosophila melanogaster. J. Heredity 30, 475-476. 4. Bridges, P.N. (1941) A revised map of the left limb of the third chromosome of Drosophila melanogaster. J. Heredity 32, 64-65. 5. Bridges, P. N. (1941) A revision of the salivary gland 3R-chromosome map of Drosophila melanogaster. J. Heredity 32, 299-300. 6. Bridges, P.N. (1942) A new map of the salivary gland 2L-chromosome of Drosophila melanogaster. J. Heredity 33, 403-408. 7. Lindsley, D. L. and Grell, E. H. (1968) Genetic Variations of Drosophila melanogaster, Carnegie Institution of Washington, Washington, D.C.
8. Lindsley, D. L. and Zimm, G. G. (1992) The Genome of Drosophila melanogaster, Academic, New York. 9. Bridges, C. B. (1935) Salivary chromosome maps with a key to the banding of the chromosomes of Drosophila melanogaster. J. Heredity 26, 60-64. 10. 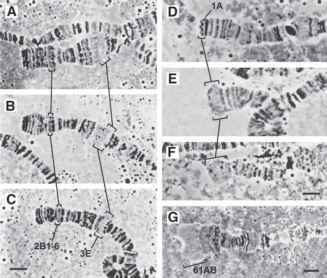 Sorsa, V. (1988) Chromosome maps of Drosophila I. CRC, Boca Raton, FL. 11. Heino, T. I., Saura, A. O., and Sorsa, V. (1994) Maps of the salivary gland chromosomes of Drosophila melanogaster. Dros. Inform. Serv. 73, 621-678. Also www.helsinki.fi/~saura/EM for EM photographs. 12. Belyaeva, E. S., Zhimulev, I. F., Volkova, E. I., Alekseyenko, A. A., Moshkin, Y. M., and Koryakov, D. E. (1998) Su(UR)ES: a gene suppressing DNA underrepli-cation in intercalary and pericentric heterochromatin of Drosophila melanogaster polytene chromsomes. Proc. Natl. Acad. Sci. USA 95, 7532-7537. 13. Kennison, J. A. (2000) Preparation and analysis of polytene chromosomes. in Drosophila Protocols (Sullivan, W., Ashburner, M., and Hawley, R. S., eds. ), Cold Spring Harbor Laboratory Press, Cold Spring Harbor, NY. pp. 111-117.